In this FEMA-funded project, APA, in partnership with the University of California, San Diego (UCSD), the National Charrette Institute (NCI), Hey and Associates, Inc., and Focused Plan, Inc., developed a set of web-based tools and techniques to help planners engage their communities in order to help them prepare for and recover from disasters. 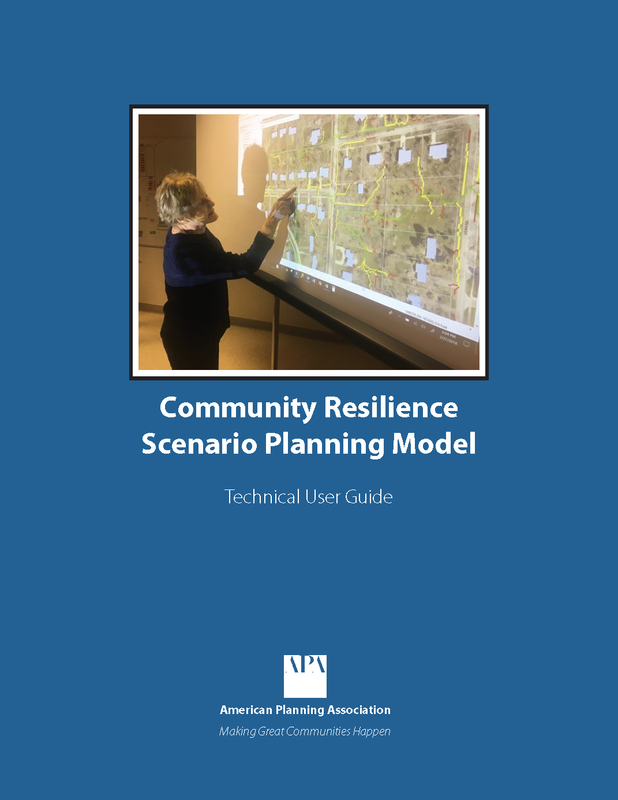 These tools and processes could be used by planners in the context of an overall community plan update, as part of special purpose plans, or in developing a stand-alone community resilience plan and implementation strategy. The primary goal of this project is to create meaningful linkages between planning and emerging technology in order to aid planners, floodplain managers, and local decision makers in preparing for and responding to natural hazards. It is essential that people feel solutions are accessible and understandable. To achieve this goal, this project explains in plain English through accessible web-based resources how planners can utilize these tools, and help to empower citizens in the process of planning for greater community resilience. By creating a resource with the capacity for future enhancements and the potential for funding outreach through professional conferences and community venues, APA looks forward to bridging a gap that has persisted for many years. Identification of parallel concepts for other threats to communities. Research staff from Focused Plan, Inc., in collaboration with Hey and Associates, Inc., the American Planning Association, the University of California San Diego and the National Charrette Institute developed this technical user guide to walk users through the process of using ArcGIS, coupled with the Arc Hydro and Community Viz extensions, to visualize stormwater accumulation impacts, explore contributing factors, and test potential solutions solutions. FEMA has worked in partnership with APA for nearly 25 years. During that time, APA has repeatedly taken the lead in pushing the envelope of understanding of the planning process as it applies to hazard mitigation, post-disaster recovery, and even the challenging subject of climate change adaptation. In its recent PAS Report, Planning for Post-Disaster Recovery: Next Generation, APA extensively details the process of post-disaster recovery planning with regard to goals and policies, the planning process, and implementation. Throughout that document, APA stresses the importance of informed public participation and the power of a guiding vision for greater resilience. In the course of completing that project, APA also worked with chapters in New York and New Jersey, FEMA recovery staff, and supportive allied organizations to plan and execute a series of training workshops on recovery planning in the aftermath of Hurricane Sandy. These took place the first week of April 2013. Over time, APA has moved its 40,000 members and the planning profession forward in its commitment to a greater emphasis on resilience in our nation's communities. One vivid demonstration of the growing interest among APA members in this topic is the official approval in 2015 of the new Hazard Mitigation and Disaster Recovery Planning Division, an excellent partner for the Hazards Planning Center in identifying special areas of expertise within our own membership. Having laid that groundwork, APA is now using this project to further advance the practice of recovery planning. UCSD has a world-class network of research centers and academic programs that are now leading urban sustainability initiatives in the San Diego–Tijuana Region, including the Center on Global Justice, Center for Urban Ecologies, Global Health Initiative, and the Superfund Research Center's (SRC) Community Engagement Core and Research Translation Core, which are funded by the National Institute of Environmental Health Sciences (2012-2017). These organizations are significantly amplifying UCSD's capacity for civic engagement in teaching and research. Communication Toolbox" project is conceived as a multi-phased effort to create a comprehensive "toolbox" of modeling capabilities for preparing, analyzing, and visualizing alternative land use/transportation scenarios at the neighborhood scale, using CommunityViz scenario planning software as a platform. The initial phase involves development of a water quality scenario planning model that utilizes ESRI's ArcHydro flow path model to provide coefficient-based modeling capabilities for estimating the costs and benefits of various types of stormwater mitigation strategies that are relevant to urban infill development projects. The flow path model also identifies areas of nuisance flooding and has been used by the City of Chicago to site and size green infrastructure practices in the most efficient and effective locations. By looking at the relationship between green infrastructure opportunities, stormwater mitigation strategies, and other important land-use and environmental planning considerations in urban infill neighborhoods such as this, planners and community stakeholders can come up with "win-win" land-use and green infrastructure solutions that will meet a variety of community needs. UCSD is currently working on the second phase of its project, which has expanded the functionality of the Phase I model and will also involve use of this model to develop suitability maps for urban agriculture uses in urban infill neighborhoods, taking into account water quality, water resource availability, suspected brownfield toxics in the soil, and various economic and social factors. c) develop science-based remediation, rebuilding, and repopulation strategies that will lead to improved community resiliency. The National Charrette Institute (NCI) is a nonprofit educational institution that helps individuals build community capacity through collaboration to create healthy community plans. NCI teaches professionals and community leaders the art and science of the NCI Charrette System, a holistic, collaborative planning process that harnesses the talents and energies of all interested parties to create and support a feasible plan. NCI also advances the fields of community planning and public involvement through research and publications. NCI is interested in assuring long-term project success through the NCI Charrette System. To this aim, the best charrette practices are taught during NCI courses by occasionally managing a charrette in response to a non-competitive request. Projects are able to move past roadblocks while NCI delivers expert project management, coaching, and direction throughout the event. The system is designed to bring together large numbers of stakeholders with disparate interests to quickly design a realistic plan of action. Through NCI guidance, a diverse set of partners and stakeholders uses a combination of "high-tech" plus traditional "high-touch" tools. High-tech tools such as CommunityViz excel at providing community members with a realistic perspective on the impacts and trade-offs of planning decisions. However, the traditional paper and pencil drawing methods occasionally work better to make people feel a part of the design decision-making process. The NCI Charrette System uses both high-tech and high-touch tools to help communities design realistic plans. In 2011, NCI was contracted by Jefferson County, Alabama, with funding by the Enterprise Foundation, to conduct a post-disaster charrette and training in the wake of a tornado outbreak. Participants included FEMA and planners, non-profits, and community leaders from three affected towns. The results were roadmaps for each town charting the post-recovery planning charrettes and activities. In more recent work, NCI conducted a five-day charrette for Center City Norman, Oklahoma, a district encompassing the downtown business district, Campus Corner near the University of Oklahoma (OU), and the connecting neighborhoods in between. The area is characterized by surface parking lots, vacant business spaces, and residential areas with ad hoc development projects housing many OU students. As a result of the charrette, a vision was developed in full cooperation with all stakeholder groups, resetting the conversation from specific, spontaneous development projects to a broader vision that acknowledges, recognizes, and honors the work done previously by the community. This vision was used to create a series of Form-Based Codes, thus implementing the vision in all future development projects. Research staff from the UCSD Center for Sustainability Science, Planning and Design — working with Placeways, its technical consultant on the UCSD "Spatial Analysis and Communication Toolbox" Project — has prepared a report outlining an approach for developing a "Community Resilience" Scenario Planning Model. This model uses CommunityViz scenario planning software and other readily available GIS software tools. The report lays out the structure and contents of the existing "Water Quality Planning Model" (UCSD-WQPM) that was developed at UCSD with consulting assistance from Placeways and other technical experts. This model is designed to allow analysis of proposed development projects in relation to stormwater runoff impacts and mitigation requirements under the San Diego Regional Water Quality Control Board's MS4 Permit. It also allows for preliminary design of off-site stormwater mitigation projects, including urban agriculture and other "green infrastructure" projects, and calculation of "Alternative Compliance mitigation credits" that could be generated from such projects pursuant to the MS4 permit. The existing model was developed with CommunityViz scenario planning software, and also utilizes ESRI's ArcHydro Flowpath Model. Al Khodmany, K. "Using visualization techniques for enhancing public participation in planning and design: process, implementation and evaluation." Landscape and Urban Planning, 45. 1999. Available at http://urbp278.pbworks.com/w/file/fetch/63254860/Reading%203%20-%20GIS%20Applications%20to%20Chicago%20Planning.pdf. Describes three different visualization tools employed during a participatory planning process in Chicago's Pilsen neighborhood. Al-Kodmany, Kheir. "Visualization Tools and Methods in Community Planning: From Freehand Sketches to Virtual Reality." Journal of Planning Literature, 17(2). 2002. Reviews both traditional and computerized visualization tools and attempts to provide a general map for planners as they navigate through the multitude of options that currently exist for visualization in public participation planning. Bishop, Ian D., and Eckart Lange (ed.). Visualization in Environmental Planning: Technology and Applications. Taylor and Francis. July 2005. Looks at how landscape and environmental planning are impacted by computer-based visualization of the natural and built environment. Includes case studies focused on forestry, agriculture, ecology, mining, and urban development. Burch, S., Sheppard, S.R.J., Shaw, A. and Flanders, D. "Planning for climate change in a flood-prone community: municipal barriers to policy action and the use of visualizations as decision-support tools." Journal of Flood Risk Management, 3: 126–139. 2010. Available at http://onlinelibrary.wiley.com/doi/10.1111/j.1753-318X.2010.01062.x/abstract. Examines a new process for envisioning local climate change futures, which uses an iterative, collaborative, multi-stakeholder approach to produce computer-generated 3-dimensional images of climate change futures in the flood-prone municipality of Delta, British Columbia, Canada. Describes the benefits of participatory scenario planning for informing climate-resilient livelihoods and disaster risk reduction with a focus on vulnerable communities. Dockerty, Trudie, Andrew Lovett, Gilla Sunnenberg, Katy Appleton, and Martin Parry. "Visualizing the potential impacts of climate change on rural landscapes." Computers, Environment, and Urban Systems, 29(3). May 2005. This paper looks at how GIS-based visualization can help represent climate change information, focusing on an agricultural area. ENVIRON International Corporation. Economic Analysis of Nature-Based Adaptation to Climate Change: Ventura County, CA. February 2015. This report explores the question of whether nature‐based interventions that capitalize on existing natural processes (e.g., wetland and dune restoration) could reduce risk from sea-level rise effectively while still protecting the natural ecosystem functions). This report is a case study from the Albuquerque Metropolitan Planning Area, where a climate change analysis was incorporated into a land use and transportation scenario planning process. Kwartler, Michael, and Gianni Longo. Visioning and Visualization: People, Pixels, and Plans. Lincoln Institute of Land Policy. April 2008. Authors Michael Kwartler and Gianni Longo present principles, techniques, and cases based on their professional experiences in developing sophisticated public involvement processes that are used to apply information technology to planning and design. LaGro, Jr., James A. Site Analysis: Informing Context-Sensitive and Sustainable Site Planning and Design (3rd ed.). Wiley. February 2013. Evaluates on-site and off-site factors to inform the design of places — including neighborhoods and communities — that are attractive, walkable, and climate-resilient. Lennertz, Bill and Lutzenhiser, Aarin. "The Charrette Handbook." American Planning Association Publishing. 2006. A comprehensive step-by-step guide for how to plan and hold a successful charrette. Lewis, J.L., & Sheppard, R.J. (2006). "Can landscape visualization improve forest management consultation with indigenous communities?" Landscape and Urban Planning, 77(3), 219-313. Analyzed the acceptability and effectiveness of a small sample of community members with various landscape management scenarios in the form of simple GIS maps and photo-realistic images. A scenario-based set of management options to guide stakeholders in future decision making regarding the fate of Jacobs Avenue in Eureka, CA. Maher, Paul, Eric Rapaport, and Patricia Manuel. "Visualizing Sea-Level Rise." Atlantic Climate Adaptation Solutions Association. May 2012. Available at http://atlanticadaptation.ca/sites/discoveryspace.upei.ca.acasa/files/Visualising%20sea%20level%20rise_0.pdf. Explores ways in which the visualization of sea-level rise could improve cognition and engage decision makers to better understand the anticipated effects of sea-level rise for climate change adaptation planning. Michael Baker Jr., Inc. "Visualizations of Adaptation Scenarios and Next Steps White Paper." February 2015. Available at http://togethernorthjersey.com/wp-content/uploads/2015/03/JC-Report-V6_021420151.pdf. Serves as a road map for Jersey City in the scoping and development of an approach to the preparation of a benefit-cost analysis of adaptation measures. Miles, Scott B. and Stephanie E. Chang. "Urban Disaster Recovery: A Framework and Simulation Model." University of Washington. July 2003. Available at https://ubir.buffalo.edu/xmlui/bitstream/handle/10477/773/03-0005.pdf. Focuses on an educational tool for illustrating concepts for community recovery, and identifying data collection and research needs for more refined recovery models in the future. Nicholson-Cole, Sophie A. "Representing climate change future: a critique on the use of images for visual communication." Computers, Environment, and Urban Systems, 29. 2005. Available at http://web.env.auckland.ac.nz/courses/geog320/resources/pdf/climate/Nicholson-Cole_Representing%20Climate%20Change%20Futures.pdf. Assesses the use of visualization for communicating climate change issues to the public, with reference to the broader theme of visualizing scenes of the future or 'futurescapes'. Phillips, Brenda D. Disaster Recovery. Auerbach Publications. May 2009. Tackles the myriad recovery issues faced by federal, state, and local emergency managers, public officials, and voluntary organizations in a long-term disaster recovery situation. Schoch-Spana, Monica, Crystal Franco, Jennifer B. Nuzzo, and Christiana Usenza. "Community Engagement: Leadership Tool for Catastrophic Health Events." Biosecurity and Bioterrorism: Biodefense Strategy, Practice, and Science, 5(1). March 2007. Available at http://online.liebertpub.com/doi/pdf/10.1089/bsp.2006.0036. Reviews the Working Group on Community Engagement in Health Emergency Planning's recommendations to government decision makers on why and how to catalyze the civic infrastructure for an extreme health event. Schulz, Jill. "The Road to Recovery." Planning. July 2010. Available at https://www.planning.org/planning/2010/jul/roadtorecovery.htm. Explains the road to recovery in Cedar Rapids, Iowa after the devastating floods of 2008. Schwab, James C., ed. "Planning for Post-Disaster Recovery: Next Generation." PAS Report, 576. 2014. Available at https://www.planning.org/publications/report/9026899/ . Offers a no-nonsense explanation of the benefits — and limitations — of planning for unpredictable events. Shaw, Alison, Stephen Sheppard, Sarah Burch, David Flanders, Amim Wiek, Jeff Carmichael, John Robinson, and Stewart Cohen. "Making local futures tangible: Synthesizing, downscaling, and visualizing climate change scenarios for participatory capacity building." Global Environmental Change, 19(4). October 2009. Uses the results from a participatory scenario study on capacity building for climate change action at the local level to examine the pros and cons of the approach. Sheppard, Stephen R.J. Visualizing Climate Change. Routledge. May 2012. A guide to demonstrating climate change through visual media to communities, action groups, planners, and other experts. Sheppard, Stephen R.J., Alison Shaw, David Flanders, Sarah Burch, Amim Wiek, Jeff Carmichael, John Robinson, and Stewart Cohen. "Future visioning of local climate change: A framework for community engagement and planning with scenarios and visualization." Futures, 43(4). May 2011. Discusses how to create local-level climate change scenarios and visualizations. Sheppard, Stephen R.J., Alison Shaw, David Flanders, and Sarah Burch. "Can visualization save the world? Lessons for landscape architects from visualizing local climate change." Digital Design in Landscape Architecture. 2008. Available at http://193.25.34.143/landschaftsinformatik-4.2.6/fileadmin/user_upload/_temp_/2008/2008_Beitraege/001/Buh_2-21.pdf. Considers how visualization tools could be utilized to improve awareness of and response to climate change. Townshend, Ivan, Olu Awosoga, Judith Kulig, and HaiYan Fan. "Social cohesion and resilience across communities that have experienced a disaster." Natural Hazards. March 2015. Reports on comparative findings of cohesion and resilience indices in four Canadian rural communities that experienced disasters and evacuation in potentially different phases of coping and resilience. Provides links to tools and techniques for regional planning, recovery, and resilience and also links to engagement and communication techniques. Walker, Doug, and Tom Daniels. The Planners Guide to CommunityViz: The Essential Tool for a New Generation of Planning. APA Planners Press and the Orton Family Foundation. 2011. An authoritative and accessible guide to a tool to let planners and citizens "see" the future impacts of a plan or development. Wells, Kenneth B., Jennifer Tang, Elizabeth Lizaola, Felica Jones, Arleen Brown, Alix Stayton, Malcolm Williams, Anita Chandra, David Eisenman, Stella Fogleman, and Alonzo Plough. "Applying Community Engagement to Disaster Planning: Developing the Vision and Design for the Los Angeles County Community Disaster Resilience Initiative." American Journal of Public Health, 103(7). July 2013. Available at http://ajph.aphapublications.org/doi/full/10.2105/AJPH.2013.301407. A steering council used community-partnered participatory research to support workgroups in developing CR action plans and hosted forums for input to design a pilot demonstration of implementing CR versus enhanced individual preparedness toolkits.